The 2000ft Indoor Duplex Fiber Assembly Cable - Multimode OM3 50/125 micron Laser Optimized, Plenum has high performance tight-buffered coating on each optical fiber for environmental and mechanical protection. Flame-retardant for indoor installations. Compatible with all standard fiber optic connectors. Resilient and flexible for jumpers, patch cords, and pigtails. Suitable for general purpose indoor use, such as routing connections in patching systems. Short "patch cord" cables ideal for links between electronic equipment and main fiber optic cables. OptiReel cable box saves installers time. 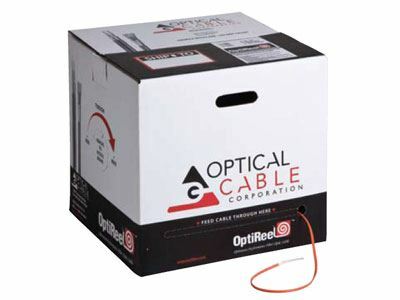 OptiReel is a self-contained payout box to facilitate storage, handling and pulling of cables. The packaging greatly reduces set-up time for each pull. Therefore, the box is ideally suited for cable pulls through building duct systems, walls and ceilings where multiple cables may be pulled together and many relatively short runs need to be installed. The compact boxes contain an internal reel so that cable stands do not have to be used. Cables in the boxes are marked with decreasing length markings, so that the installer always knows the length of the remaining cable in the box.